The past two years have not been kind to Facebook when it comes to user data. Facebook relies on the data it gets from its users to power the ads that pay for the platform. However, people have grown more concerned about how much information they are giving to Facebook and what is being done with it. There have been increasing calls for Facebook, Google and other tech giants to give users better control over what data they send. 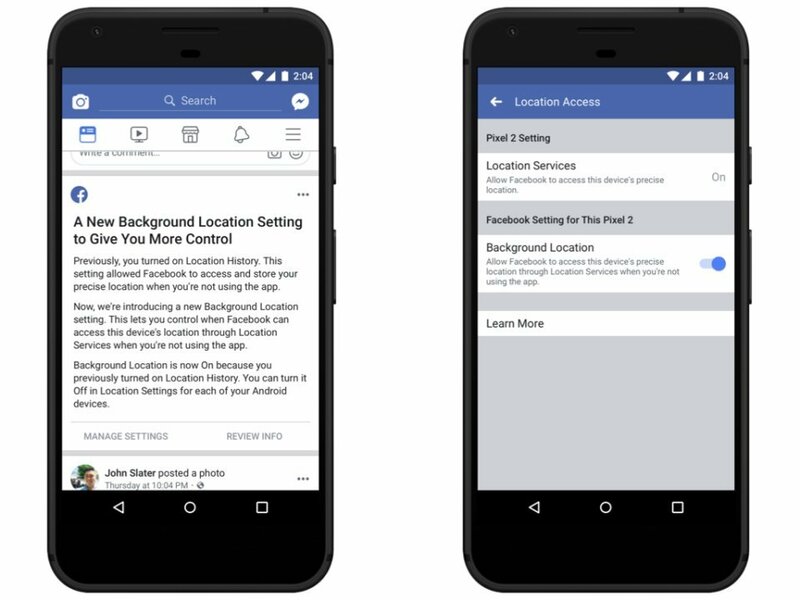 To give users better data control when using their mobile, Facebook has added a feature to its Android app that controls background location tracking. By their nature, smartphones are essentially walking trackers that know where you are all time. It’s how they know where to send the data for your phone calls. Companies that have smartphone apps have been able to use that location data to provide some of their app services and to select relevant ads. Controversially, apps may be accessing location data, even when the app isn’t on. Since many people aren’t too thrilled about this tracking by apps, it’s possible to turn off location sharing. For Android users, the location setting either on or off. However, consumers using iOS (i.e., anyone with an iPhone or iPad) have multiple options. They can choose to share their precise location always, only when the app is in use, or never share it all. Facebook is alerting users on some Android device users about the change. Specifically, anyone who chose to turn on Location History in the past will get a notification asking them to take a moment to check that their settings are right for them. If the user never turned on Location History, they won’t have to do anything. Though it may seem like this is a move in support of privacy, the addition of this feature to Android is better for Facebook. As things were, if a consumer with Facebook on their Android device had concerns about location sharing when the app was off, their only option was to turn off location sharing completely. Now, Android users will have the opportunity to only share their location when their Facebook app is open. Facebook may not get as much location data as it would like, but it’s better than getting no location data at all. This change is something that business owners and marketers should take notice of. Geo-targeting an audience in a Facebook ad is only useful if Facebook knows where people are. If everyone has the location sharing turned completely off, it’s harder for Facebook to serve ads to people in a specific area. The new option will allow geo-targeted promoted posts and ads to work on the Facebook app without raising the cost to advertisers. Social media giants will continue to refine their services to meet the security and privacy needs of consumers. Business owners and marketers can expect to see more actions like these, which seek to address the concerns of the public while allowing social media companies to continue making money. For more recent news about social media marketing, read this article on an upcoming change to Facebook advertising that will affect default ad settings later this year.